It seems like spring is on the way here in Gunnison Country. The weather has been warming up, and the mornings are now likely to be fifteen degrees above zero rather than below. This last storm was epic and although I had originally thought that perhaps a deep cold would follow, the reality has been that the air temperatures increased somewhat dramatically. In my chronological progression of hikes, I am still working on May of 2006. And although May is still months away, this recollection of thoughts and photos reminds me, the intrepid trekker, that the white will turn to green soon enough. The aspen are now in slumber, but soon the buds will begin to enlarge and then the aspens’ catkins will bloom and suddenly one day, the leaves will greet the sun after a long winter’s respite. I titled this hike “West Elk Creek – May of 2006”, and indeed that is where the terminus of this particular hike was at. However, this hike followed what is called on maps “Lion Gulch Trail”. In fact, the trail does start at Lion Gulch and passing through Elk Park reaches a summit that divides water between Lion Gulch and West Elk Creek. This trail is also called TR536, and may be accessed from Red Creek Road (FR723). West Elk Creek is one of three major drainages on the south side of the West Elk Mountains. This is some rough country. 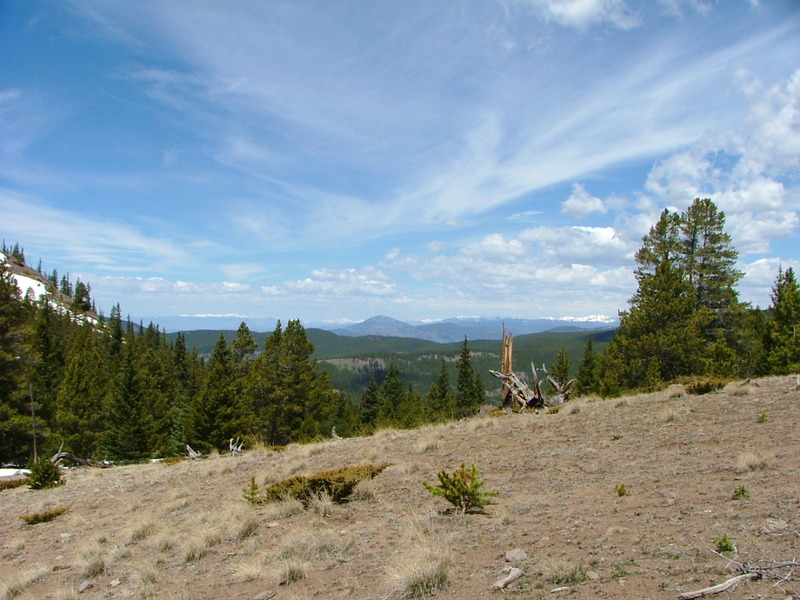 Being one of the first ranges of the Rocky Mountains, this small chain receives more than its share of moisture and consequently, the forest is thick and dense. Because the West Elk’s are not only volcanic in nature, but formed of easily eroded breccia, the gullies and canyons are steep and difficult to move around. I don’t know why the United States Forest Service built this trail, but it follows Lion Gulch for two miles to a small pass and then descends another two miles over numerous switchbacks until fading out at West Elk Creek. I have never attempted to go up or down stream because the terrain and vegetation seem daunting. The creek at this time of year was also in flood stage and any crossing would have been treacherous to say the least. I took this hike during mid to late May, and the leaves of the aspen still have that early season green. Not the darker green of high summer, but a lighter green signifying newness and rejuvenation. I took a handful of flower photos, and they are all early season flowers: Red columbine, clematis, lupine and arnica are abundant wherever conditions permit. This is a fairly easy trail, although it is about eight miles total round-trip distance, and requires over a thousand feet of vertical gain to extricate oneself from the deep canyon. The lower portion of this trail allows for close-up view of the breccia common in this area. The breccia is soft, comprised of volcanic ash that engulfed large pieces of harder volcanic rock (See “Roadside Geology of Colorado” by Chronic and Williams for a better description). When subjected to millions of years of water, ice and wind, the results are steep and deep canyons and numerous hoodoos and palisades throughout the region. There may be pinnacles with one lone hard rock suspended by a column of softer ash. The volcanoes in the area are long extinct, having erupted 25 to 35 million years ago, but their legacy lives on. Naturally, I had the pack with me. My three amigos, Lady Dog, Lucky Dog, and Sheba. This is a very quiet and secluded hike, no mountain bikes or other mechanized vehicles allowed as half the trail is within the West Elk Wilderness. The dogs and I had a good rest and lunch in a small meadow, where we were accompanied by bird song and the constant din of the nearby West Elk Creek, swollen with snow melt and muddy brown, reminding the viewer of the unending process of erosion occurring at one’s feet. They, the dogs that is, found an old elk metacarpal or metatarsal and promptly set about to chew and gnaw on what little remained of the hide; the hoof however was a singular treat of much delight. This is another hike that has had much of its emotional concentration diluted by time and the constant addition of other memories. I have a vague recollection that I have done this hike once, maybe even twice, again (Hmmm….I found photos from June 05, 2009 – I’ll post them at the proper time). I look forward to comparing that hike with this. What I notice about this hike, looking at my photos, are some things that belong to this hike alone and others that are more general themes. Generally, I see that some of my landscape photographs are tilted and that the horizon isn’t as level as should be. I have attempted over the past few years to solve that problem and generally get it right. The big limitation to this point-and-shoot camera is a lack of manual focus when using the camera in macro mode. That can create difficulties when trying to use the auto-focus on flowers and other up-close objects. The camera doesn’t always focus on what I would like, but over time I have begun to figure out ways to trick the auto-focus. The red columbine, like little red rubies under the aspens, for some reason have been difficult for me to get a good photo of over the years. One time, I used a friend’s SLR-style camera that had a manual focus and what a difference it made. Specifically to this hike, I notice the rugged canyon of West Elk Creek. The odd geology and erosion of the breccia captivated me. The harder rocks suspended in the relatively softer rock have allowed strange formation to exist as time patiently works its magic. Enjoy the photos, and keep on hiking! A rare clematis. 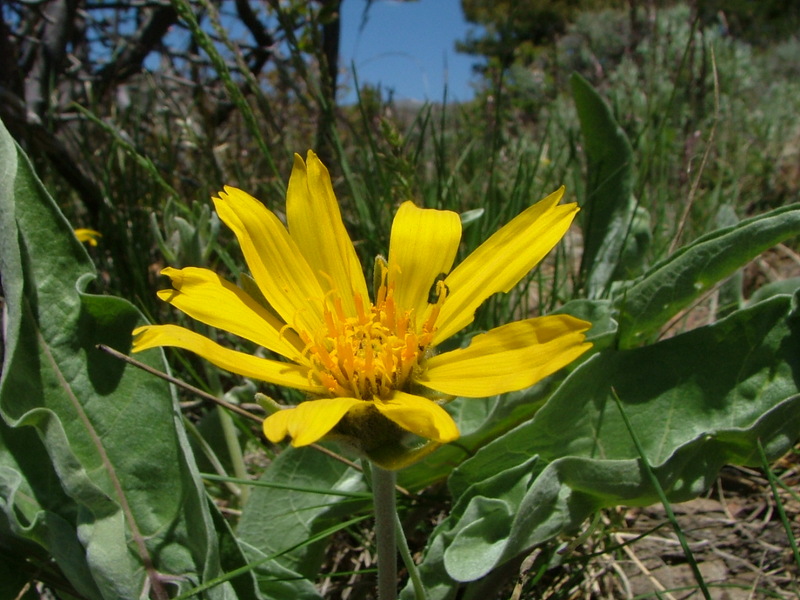 Most flower books for the Gunnison Country neglect to mention this flowers presence. Nearly eight years have passed yet this hike remains fresh in my mind. I’m not sure why, exactly, this particular adventure seems so current while other treks taken at relatively the same time are but distant memories long faded and worn. Perhaps because the two titular drainages evacuate the water melting from the east slopes of Antora Peak. This peak is visible from many locations throughout Gunnison Country and consequently serves as a reference point on numerous occasions. Even when traveling the main highway, U.S. 50, east of Gunnison, the peak is in view. For topography geeks like me, Antora Peak holds another relevance – it is within a few miles of one of the major triple divides in North America. About three miles to the northwest lies Headwaters Hill, off of which waters flow into the Arkansas, Rio Grande and Colorado river systems. I made a pilgrimage to this site this year, just to gain perspective. Perhaps also, ever since this hike I have desired to visit the summit of Antora Peak, yet have not found it in me to do so. This year, I have put it on the list of accomplishments to be seen through. I don’t believe the mountain to be technically challenging beyond the normal challenges found in ascending and descending any peak. Rather, my concern is and has been access. But that is no real excuse, as access may be a bit challenging but definitely exists in one form or another. Regardless, this summit hike won’t be done till June at the earliest, so for now I will concentrate on recording the past. To get to the trail-head, I had to drive nearly an hour east and south of Gunnison over Cochetopa Pass. Saguache Country Road 38FF provides access. This area is part of the Cochetopa Hills and also comprises the lowest part of the Continental Divide in Colorado. East Middle Creek directly drains the Great Divide while Indian Creek’s waters drain from the western face of Antora Peak. Perhaps because of its relatively low elevation and southern aspect (although the Continental Divide generally trends north-south, in this region, for about twenty or thirty miles, it jogs east-west. So, I was on the eastern side of the divide, but due to the local trend, I was on a south face) this area is much drier than most of the Gunnison Basin. Nonetheless, there is still much forest especially in aspects where it is cooler and moister. There are more broad swaths of grassland yet that same grass doesn’t grow as tall nor is as densely dispersed as in the wetter Gunnison Basin. The trail-head is at the end of the county road; the trekker can head north along Middle Creek or take off to the east along Indian Creek, a tributary. I chose the latter. The Indian Creek trail (Rio Grande National Forest TR766) has been rerouted from the trail-head along a ridge, but I was able to follow the old trail in the valley floor. I always enjoy wetlands in drier areas, as the wetness provides more diverse habitat. So, I walked along the valley floor until the trail began to fade. It was obvious that the newer, ridge-line trail was the preferred route, and I had to scramble uphill till I found the newer route. Eventually, the Indian Creek Trail leaves its namesake creek and follows a minor tributary to the north that leads to the summit of the divide between it and East Middle Creek. At this summit, the Indian Creek Trail becomes East Middle Trail (TR767). This summit lies at about 10,900 feet and the ridge continues to rise to the east until reaching the summit of Antora Peak itself, which lies above 13,000 feet. I stopped here to have lunch and enjoy the extensive views to the south and west. The northern view was the Great Divide a few miles away and that to the east was the summit of Antora. But to the south one could make out the distant South San Juan and closer La Garita Mountains. The view to the west is made up of the West Elk and Elk Mountains. Between those distant ranges, Tomichi Dome, some thirty miles closer, punctuates the separation between the two. Despite the drier conditions generally, at this high elevation there was still a goodly amount of snow clinging to the north face. The trail I was to follow had as of yet to be melted out. The meadow the trial traversed was indistinct in its outlet and I ended up losing the trail by going down another gully than the one I was supposed to go down. But no matter, really. That just meant more bushwhacking and less trail hiking. I knew that regardless of whether I was in the proper gully or its nearby twin, that I would end up in Middle East Creek and find the trail there. And although my route was more difficult and challenging, that is exactly what happened. Once on the trail, I made my way down to the trail-head. Although I carry a compass, I rarely use it. More generally, I pay great attention to what drainage I am in and where the nearby summits, divides, ridges and passes lay. My thought process then works through what would happen if I were to cross over one such topographic feature and where it would lead me. So, when I became confused in the snow covered meadow, no sign of the trail to follow, all blazes obliterated and missing, that it didn’t really matter because I knew that be exiting the meadow on any downhill side would lead me to my destination. Of course, I had to climb over more fallen trees and found myself on some unexpectedly steep slopes, but my premise was correct. Once I reached the bottom of the gully at its confluence with East Middle Creek, I quickly found the well marked and blazed trail. From there it was an easy hike to the trail-head. All in all, a nice nine mile hike. Naturally, this was a full-pack affair. Meaning, I had all three dogs with me – Sheba, Lady Dog and Lucky Dog. They all enjoyed the explorations, as most dogs do. Early season hiking does present its challenges, what with blockages of snow and the resulting post-holing that must be endured to cross these at-times extensive snow-fields. However, the rewards are that I get to see many early season flowers that summer-only hikers won’t. There is also something special about being out and about during that critical time, when winter’s grip is just letting go the baton-of-life and spring is about to pick it up… the first shoots of green grass, the newly-budded lime-green leaves of the aspen; overall, that sensation that life is about to erupt and burst forth from its slumber. The winter to spring transition is truly a miracle to behold, a prelude to the easy summer time. A good time to whet my skills and prepare for the abundant summer joy that lays just ahead. I hope to relate a journey to Antora Peak later this year, in the meantime, keep on trekking! Iris missourianis is one of two species of the iris (Iridaceae) family in the southern Rocky Mountains. Around town, here in Gunnison, Colorado, people have been talking about the spring-like conditions suddenly prevalent. Prior to this storm system, we had been in a long-term deep freeze, overnight temperatures hovering around zero night after night. I had been worried that this new snow, of which the high country surrounding us received upwards of seven feet, would send the temperatures plummeting, but instead these moisture laden clouds have brought with them relative warmth. Prior to last night, the two previous nights didn’t even freeze, an usual occurrence in our high mountain valley. Nonetheless, a blanket of whiteness lays heavy over the land. I know that fairly soon the snow will melt away and greenness will replace the stark cold with verdant splendor. These pictures are proof of that, that this annual miracle will take place. I notice that the cottonwoods have their first leaves, a special shade of lime-green that slowly darkens as spring turns into summer. 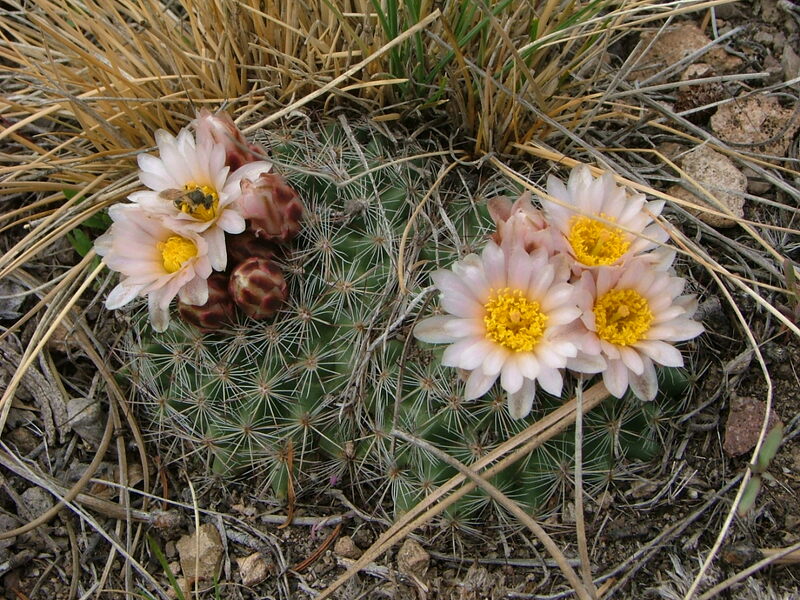 The cactus are early bloomers as well as a few other species at this elevation. This a one of my classic hikes; easy to access at the group campground, relatively lightly used and although not wilderness, it is road-less and quiet. From my vague memories, I don’t believe that I hiked far that day. I remember sitting under one of my favorite trees in the upper Gunnison Basin, a large ponderosa pine, one of the few in the region. These trees have long been a favorite and in my eyes this individual tree is gorgeous. I have hiked this trail repeatedly and always pause at this tree and enjoy the radiant beauty that mature ponderosa trees exude. This was a short hike, as I stopped at this tree located a scant two plus miles from the trail-head. I don’t believe that it is as far north as Bear Gulch. I ate lunch and enjoyed the spring day, although from the photos it appears to have been a cloudy day. Regardless, I always enjoy that time of year, as winter’s promise is fulfilled by spring’s never-failing return. Sitting under the ponderosa, I was worried not about the world spinning away with its never ceasing busyness nor my busy life within that world; rather, I could enjoy nature’s grandeur and temporarily still the chattering monkey that inhabits my mind. Lady Dog, Lucky Dog and Sheba were my trusted companions as was the norm of that era. I have many more photos and stories to share about this particular creek and the surrounding area, and over time will share more about the natural history. 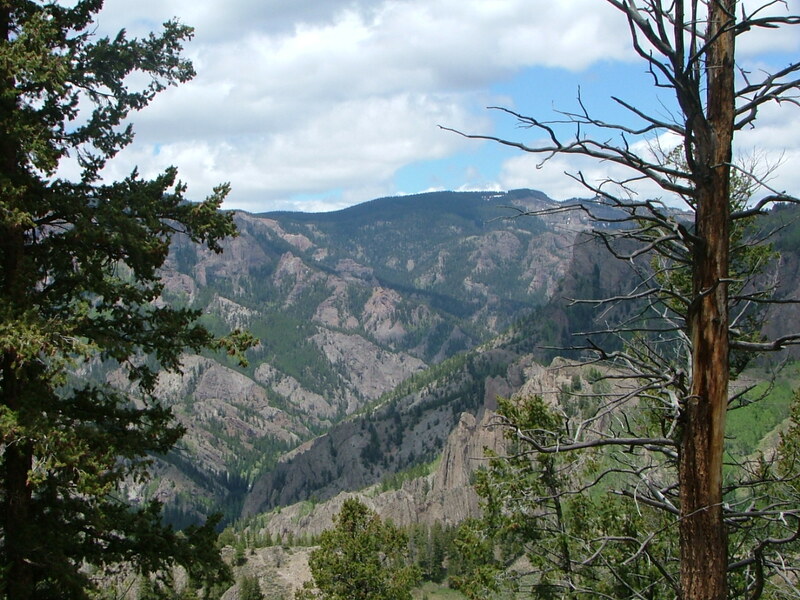 This area is rich with wildlife and forms the southern slope of the West Elk Mountains. East Elk Creek drains into what was once the Gunnison River but is now Blue Mesa Reservoir. It is a shame about losing the ecological heart of the upper Gunnison basin under artificially stilled water, but there is still much to be explored and enjoyed. It is indeed interesting to see how some events in the past seem to take place so long ago, and others, occurring at relatively the same time, seem recent. Looking over the photos that are in my “May 2006” folder, some of these hikes seem like ancient history, part of the fabric of my being, perhaps a trail that I have hiked so many times that it all blends into one remembrance. Others seem like they occurred yesterday, with a mental tag to explore an adjacent area as soon as possible. The Hermit’s Rest trail starts at a eponymous road side rest along SH 92 and descends 1500 feet in about three miles into the Black Canyon of the Gunnison. The trail terminates at Morrow Point Reservoir after winding down the southern slope of Cimarron Point. I used to hike this trail fairly often, especially in the spring and fall, as the southern exposure melted the snow off early or kept it from sticking late, respectively. I don’t particularly care for this trail during summer as the southern aspect causes the sun to sear and scorch. At the trail-head, there is a great view to the south, with the San Juan Mountains dominating the horizon. Once at the terminus, the hiker is rewarded with an opposite view of the canyon – instead of looking down into the abyss, the view is inverted so that one who casts his gander about must invaribly turn his head skyward, towards the light of the distant sky and canyon rim. Although this hike is quiet, it does lead to an artificial inpoundment in the form of Morrow Point Dam and Reservoir. The Gunnison River here is a casualty of the March of Progress, a once mighty river tamed by what may be simultaneously and paradoxically called both mankind’s ingenuity and hubris. Where rapids and whitewater once defined the torrent streaming off the mountain’s ramparts, where surveyors and engineers constructed a railroad that was a marvel to behold (so we are told) and which has now been relegated to the dust bin of history, where Indian and mountain man tread with a freedom and independence that cannot now be equaled in our current paradigm, what has replaced all that is a pool of placid water gently lapping at the nearly vertical shore, producing electricity for the masses and sending water off to distant orchards and cities. Some would say this is a fair trade, others that the forces of nature have been squandered. As for myself, I fall in the latter camp – I would prefer a wild and free river to carry my wandering soul and spark my wandering imagination. Despite my regrets and suspicion, this is a good hike when a body needs to get off the snow and feel the earth beneath his feet. It has been years since I walked this stretch of trail, perhaps I’ll visit again in the near future. One reason, however, that I haven’t been back in such a long time is that it is about an hour from Gunnison, and there are many more scenic trails closer to home. Over the years, I would guess that I have hiked this trail maybe a half a dozen times, but this particular hike is of special interest to myself. On this hike, I met my close and dear friend Katherine, whose is now married to Eric and has likewise become a close and dear friend. As will be seen in the attached photos, I had the pack with me that day – all three dogs with me, Lady Dog, Lucky Dog and Sheba. Lady Dog, being concerned with nothing more than food and the occasional scratch behind the ears, but especially food, was strolling along down the trail as were the other dogs. Lady Dog stopped without much warning upon an otherwise innocuous portion of trail, bent down and eagerly and greedily scarfed a large piece of what I thought was a slice of lunch meat. Then she found another, and at first I was concerned about poison bait or who know what. Thinking it through rapidly, I figured that the sliced delicacy had been inadvertently dropped by a passerby. As it turned out, I was correct in my latter summation, and roughly a quarter mile later I found Katherine sitting on a bench with her dog Lucky. She had wondered what had happened to that part of her lunch, so we were both able to solve our respective mysteries. From there, we completed the hike to the reservoir and returned later that afternoon. Long story short, we have been friends ever since. Funny, isn’t it, how some thing like that work out. 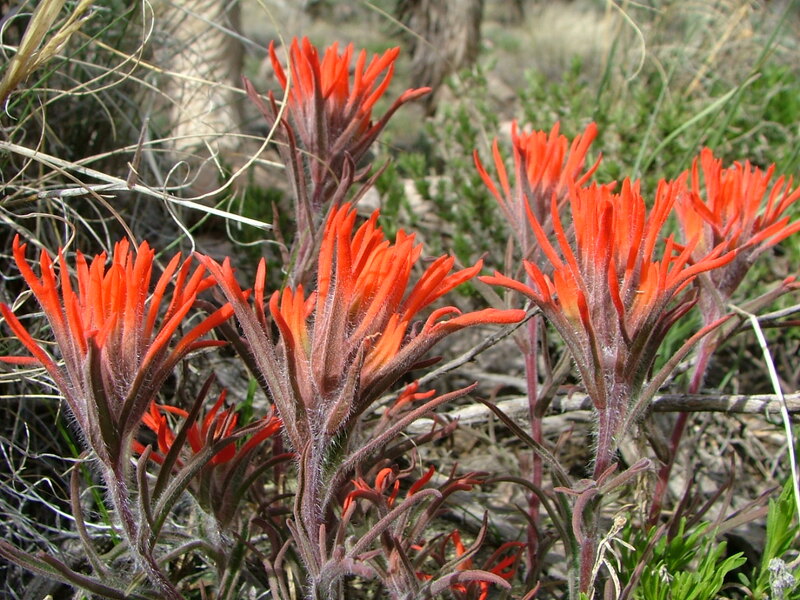 Another consideration regarding this hike is that during early or mid-spring, there are some early flowers here. I took some close up photography of these same flowers, with varying results. I’ll spare the viewer some of the egregiously poor applications of technology and reward the same brave soul with more successful endeavors, however, for the sake of posterity, I will include one out of focus calamity that still has some merit in composition. Also, for every champion, there are many second, third, fourth, etc… runner-ups. I keep most of the poor shots in my database, although some would say I should discard something of so little value, because it helps remind me of what I was looking at that day. What with all the fresh snow that has fallen recently, it is difficult to imagine than in a few short month these same flowers will be in bloom. I eagerly await their return, the miracle of life that it is. Hermit’s rest trail and Sheba in the foreground and Lady Dog in the background. Notice that the Gambel’s Oak (Quercus gambelii) has no leaves. They usually don’t leaf out until early June, being the last deciduous tree in the region to do so. A close-up of Arrowleaf Balsam-root, Balsamorhiza sagittat. A member of the Aster Family, Asteraceae. Snow we had asked for and snow is what we got. This is the first morning in the last week that we haven’t had some new snow on the ground. The storm started cold but has warmed up considerably since then. The Pineapple Express is what I have heard it called. There have been numerous avalanches and snow slides where the terrain allows that phenomena. I am not much of a powder hound, unlike the skiers up in Crested Butte. Both the lift-assisted folks and back-country types have been having a ball. I’ll get out soon, but for now have been content to wait till the snow settles a bit. In the meantime, I have been shoveling snow and otherwise working. I’ve kept myself and the dogs in the front country, as I am fairly timid when it comes to avalanches. To be sure, I have my safe places, where the terrain isn’t prone to snow sliding down. Yet, I have been caretaking friends’ critters and otherwise running around enough so that I didn’t feel the need to further battle the whiteout conditions and otherwise challenging road conditions to get out into the woods. I was supposed to have my uncle as a guest for a couple of nights, but due to the snow and treacherous highways, he and I felt it better for him not to make the journey here. Such as it goes. So, now I revisit the past. After starting off my reminiscences with a road trip, I now turn to my main focus, which is hiking and trekking and exploring some of the wildlands within and surrounding the upper Gunnison basin. I haven’t been able to determine the exact date of this particular day-hike, but I believe that it occurred in early May of 2006. This hike I begun at Needle Creek Reservoir, at the trail-head to TR493. Needle Creek is a southern tributary to Tomichi Creek which drains into the Gunnison River. Needle Creek is named for Needle Rock, a small eminence that juts from the earth as a needle-like spear of rock. Early May around 9000 feet. The grass is just beginning to green-up. The aspens haven’t leafed out yet, but are very close. I can’t say for sure what the weather was like, as those details have slipped my mind, but judging from the photographs, it was pleasant. Perhaps a bit windy or breezy, but warm. Warm, and with new life on the way. Plenty of water everywhere, as the recent melt-off of the winter’s snow cover sends water cascading down in numerous rivulets and gulches. As I walked south on FR781 and along Needle Creek itself, the vegetation changed from sagebrush and aspen filled gullies to a Lodgepole dominated forest. The road led to the upper end of the Needle Creek drainage and over a small, unnamed pass that led into the Razor Creek Drainage and Razor Creek Park. At that location, I explored the old Hughes Mine and an old Cow Camp. I thought Razor Creek Park was a pleasant location, good for sitting a bit and contemplating the changing season. I continued downstream along Razor Creek, following TR501 to the upper end of Lower Park, another beautiful setting. This park collected heat due to its southern aspect and was consequently drier than the upper park. There were flowers in bloom here, unlike the higher and colder parks. This was a good hike, about eight miles in total. Not dramatic country, like the high peaks, but more low key. Good habitat for wildlife. Granite rock outcroppings. Streams gorged with the melt-off, but none too big to be easily managed in crossing. Beaver dams here and there, thick forest typical of the elevation. Willows along the creeks, ready to bloom with both flower and leaf. A good day for me and the pack. That’s right, I had forgotten… I had the entire pack with me that day. Lucky Dog, Sheba and Lady. A good crew, all gone save for Lady. Lady in an old girl now, but in those days, as the photos attest, she was a trail worthy hound and joined in numerous outings. Dogs live for the moment, and this moment was just one of many highlights in their short lives. Edit: A couple of further notes about this hike. I hadn’t considered this when posting this originally, but this was my first day-hike that I took digital photography. I don’t recollect that being a special moment in anyway. It didn’t take me long to make a full and complete switch from film to digital. I doubt that I am alone in that regard. I like digital because I feel unrestrained by the limits of film. I get instant feedback, and never feel that I am wasting a shot by taking it. I had previously thought that film was limiting my ability to capture images because I had been so worried over cost and waste. The needle creek area was peaceful and quiet that day. But solitude seekers should beware that the area is open to motorized vehicles. I visited during spring aka “mud season” and therefore had the place mostly to myself save for a handful of people fishing the nearby reservoir. During summer, there will be people out on motorcycles and ATV’s, and during hunting season, I would expect a crowd of motorized users. Odd…January of this year was nothing but sunshine and clear skies. Nary a cloud to be seen much less disgorge much needed precipitation. So far in February, we have been inundated with snow. Much of the eastern half of the nation is having difficulties with the cold and snow, but it is just par for the course here in Gunnison. The days are finally, perceptibly getting just a bit longer as the sun makes its slow way north. Not that it makes much difference with the continual cloud cover that blots out the morning alpenglow. Normally, I don’t mind when the snows arrive, even if it does mean more work in the form of monotonous shoveling. The snow usually arrives with a warm weather system, and after weeks of morning temperatures hovering at zero degrees, the twenty plus degrees of a snow laden morning seems balmy. Yes, balmy, as in pleasantly warm. A lighter coat, maybe even a layer or two less clothing in general is the order of the day. Now, this latest round of storms is kicking in at about five above zero, which means that when the clouds lift and a high pressure system sweeps in and pushes all the moisture out, the morning will break still, sunny and cold. I expect to see minus ten or so after this week, but who can tell for sure. A man takes a chance when trying to accurately predict the weather a week or more in advance. Personally, this is the time of year when the winter doldrums strike with their utmost ferocity. Tasks become difficult to accomplish; dishes pile up; why get out of bed when the future is nothing but bleak. I may have mentioned this before – but in the depths of winter, it is difficult to believe in the existence of summer. Of course, this works both ways. But now is winter, not summer when the thought of all this cold, snowy whiteness outrages the sensibilities that are held sway by the abundance of greenery. The knowledge is there: That the roots are waiting patiently to burst forth with spring’s glory. At times the thought of hibernation is appealing, yet my thoughts often return to what I would miss. The winter’s sun bursting forth with all its red spectrum at the dawn, icy crystals suspended in the air twinkling as if electrically charged; the completeness of the sacred cycle of life. Winter, for all its challenges and tribulations, is a time of death and rebirth; the land is wiped away like a clean slate and the tablet is readied for the new year. It is seamless, and to my limited sensed, timeless. Now, back to the past and the final log for this long ago road trip. After leaving Mission: Wolf, I traveled north to Denver with one of the long term staff, Kathy. Perhaps I met her in the Metro Area, but those particularities have been lost in the fog. Our task for the day was to visit one of larger animal shelters in the area to evaluate and opine on a specific canine that had come into their hands. The thought was that this individual was a cross of domestic dog and wild wolf and therefore should not, nor could not by law, be released to the public. To be honest, I don’t remember the specifics of this critter, much less his name. He looks dog-like to me in these photos, but I believe in the end Mission: Wolf took him in due to certain traits he had. I would need to talk to Kathy to have my memories jogged, as they have melded into a gestalt that gives only an average sensation but leaves out the individual. After that business, I remember visiting a dim sum restaurant on Alameda Avenue. I only remember because of the photo. I do remember that another friend, Tamas, was there. Some of the dumplings were pretty good, others were mediocre at best. Afterwards, we all traveled up to Boulder on the Turnpike were I may have spent the night. Again, I’m not sure. It is possible that I immediately returned to Denver and continued my travels solo. Why the trip to Boulder? Perhaps to meet another friend, Josh. But the recollections are vague at best and this is only a guess. It could be that I returned to Denver to spend the night, or that I returned to Denver to immediately continue my road trip, solo. I also vaguely remember being in the passenger seat for the haul up to Boulder, but for the life of me, I can’t remember what I would have done with my traveling canine companions. Nonetheless, once I returned to Denver, I headed back south in the direction whence I came earlier. I followed the interstate to Colorado Springs, where after seperating myself from the main flow of traffic, I followed the old stagecoach road between Colorado Springs and the Cripple Creek mining district. In fact the upper part of this road is an old railroad grade that belonged to the Colorado Springs and Cripple Creek District Railroad. As the photographs will show, there are even a couple of old tunnels this county road continues to use. Naturally, I enjoyed this drive for its scenic and historical virtues. But it is slow and winds all around and furthermore lacks pavement. For these reasons, it is relatively lightly traveled, the bulk of traffic following the normal route via paved state highways. Now, if you are like me and prefer the road less ventured, then have at it! This particular road brings the traveler into the east side of the district. 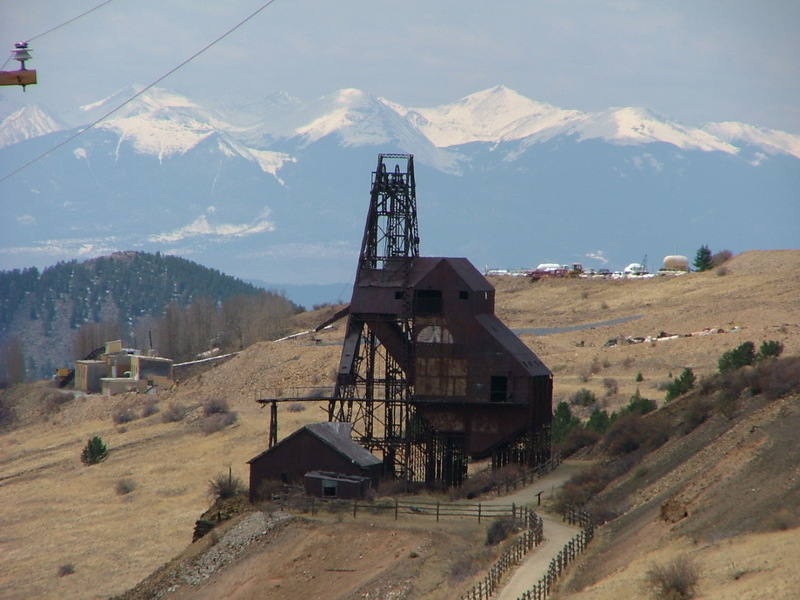 I visited both Cripple Creek and Victor, the two principle towns in the district, although there were at one time numerous smaller communities scattered wherever the ore had been deposited and subsequently discovered by the seeking hands of man. Although Cripple Creek is the principal city in the region and continues as county seat, I find Victor to be the more interesting of the two. I think of Victor as being the most interesting mining town in Colorado. In fact, I think of it as being the most interesting of all those that I have visited. The reason is that a large number of two and three story brick buildings remain intact; partially also is the setting at 9600 feet in elevation with a good southern exposure. I have made the visit to Victor a dozen or so time over the years and look forward to the next time I visit, whenever that may be. In the meantime, keep on hiking and exploring, you never know what is over the next ridge. Don’t you want to see? It’s snowing again in Gunnison, where I live. Its a cold snow, too. The thermometer decried a temperature of five above zero this morning, and nothing to behold in the sky but thick, snow-laden clouds. Last week, on Thursday, I went snowshoeing with the shepherds. We went to Willow Creek just downstream from Ohio City. Then, it was snowing heavily with no chance of blue sky. Today, it seems that these clouds may burn off. Willow Creek is another of my favorite places, especially in winter. Little used, little danger from avalanches and lots of room to mosey about. Once again, I didn’t take any photographs as I have many. Naturally, in retrospect, I wish I had had my camera; the snowfall and cloud cover that day created a limited visibility and some things that had been familiar took on a new boldness when set out from the usual scenery. Once, nearly two decades ago, I was wildly passionate about wolves. 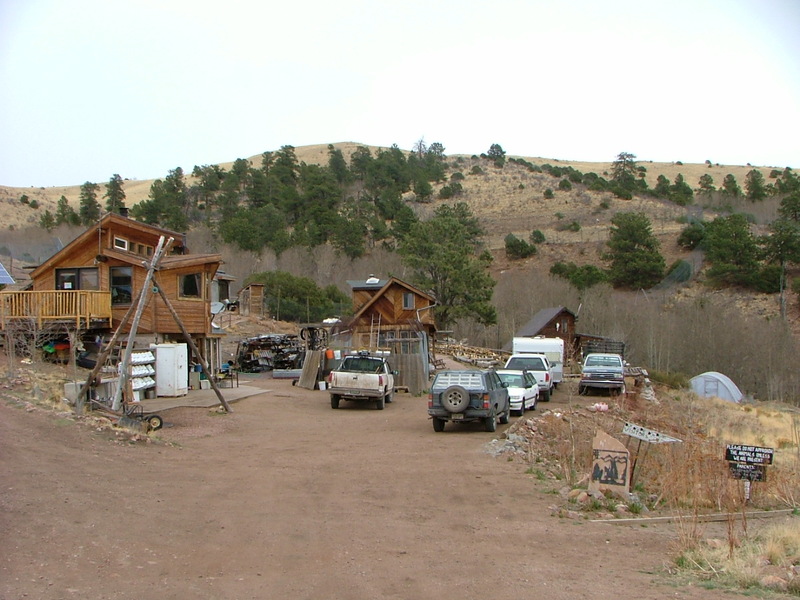 Long story short, I found myself living at Mission: Wolf, a captive wolf refuge in the foothills of the Wet Mountains. We had no municpal services and were remote from civilization. I remember the first time I drove upstream into the Huerfano Valley and how smitten I was with a love and appreciation for the land. I lived there for the better part of a decade before other pursuits called. I still miss it to this day, can remember how the land smelled fresh after a summer thunderstorm, the aspens in fall with their bright yellows and the long winter – wind and gray, challenging the soul and yet starkly beautiful. These photos were taken in April, a classic Rocky Mountain spring day. Most people don’t realize that March and April are the wettest months of the year in these mountains. This day seems typical from what I see of the sky in the photos. Clouds, gray and laden with moisture, perhaps sweeping up-valley from out on the plains. The nice thing about the cloud presence – there would not be any wind, the desiccating wind being more troublesome than the searing sun. ‘Tis likely that what moisture was present was withheld, but I truly don’t remember. It could have snowed or rained, if it was a warm storm. Or, the clouds may have been burned off by the warm, spring sun. But I remember these views, the clouds in the valley, us on our mountain perch looking down onto the tops of some. I think everyone who loves the land has a place, a special place that calls out to them. This was mine when I lived there, and still is although I seldom am graced by the view anymore. Nonetheless, this land I hold in my heart.